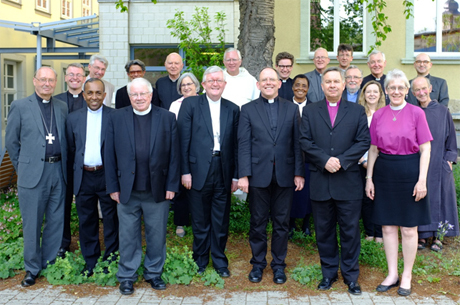 The Anglican-Roman Catholic International Commission (ARCIC) held the seventh meeting of its current phase (ARCIC III) in Erfurt, Germany, 14-20 May, 2017. The Commission met at the St Ursula Educational and Catechetical Centre of the Diocese of Erfurt. The Centre is on a site which has been home to communities of consecrated life for over 800 years. A community of Ursuline sisters occupy part of the site and continue this tradition. The Commission is grateful to the director of the house Frau Carla Riechel, the guesthouse team, and the Ursuline sisters for making its stay so comfortable and for the context of prayer and spirituality in which it was able to conduct its work. The Commission also thanks Professor Myriam Wijlens for making so many of the arrangements for its time in Erfurt. The Erfurt meeting marks a considerable step forward. In response to the first part of its mandate, to examine “the Church as Communion, local and universal” the Commission completed an agreed statement, the first of its current phase, entitled, Walking Together on the Way: Learning to be Church – Local, Regional, Universal. That the text was agreed owed much to an extensive process of redrafting over twelve months. Walking Together on the Way employs the method of Receptive Ecumenism to examine the structures by which Catholics and Anglicans order and maintain communion at the local, regional and universal level. It examines common theological principles that Anglicans and Catholics share, and the differentiated structures, based on these principles, by which they make decisions. This method invites both traditions to repentance and conversion, by looking at what is underdeveloped or wounded in themselves. It is also predicated on the belief that in our dialogue partner we meet a community in which the Holy Spirit is alive and active. We can therefore ask firstly, where our communities are in need of reform, and, secondly, what we can learn from the our dialogue partner to help us in this growth. The Commission described this process as “receptive learning”. The text prepares the way for the next ARCIC statement on the second part of its mandate, “how in communion the local and universal Church comes to discern right ethical teaching.” The Commission took time to review its work to date on this theme and proposed a schema to be approved at the Informal Talks in October. Building on the ecclesiological text, the schema will guide the next phase of the work of ARCIC III. The Commission had decided to meet in Erfurt to mark the 500th anniversary of the Reformation. Erfurt is a significant city in the life of Martin Luther. It was here that he studied, decided to enter the Augustinian order, made his vows and was ordained. On Wednesday 17 May the Commission visited the Augustinerkloster where we were guided by the minister, the Revd Dr Irene Mildenberger. Afterwards the Commission was given a guided tour of the Roman Catholic Cathedral of St Mary’s by Dr Markus Schnauß. On Thursday 18 May, the Commission was privileged to meet the Catholic Bishop of Erfurt, the Most Revd Ulrich Neymeyr, who spoke about the pastoral challenges faced by Christians in his diocese. ARCIC III was particularly glad to complete its first agreed statement, and the first ARCIC statement since 2005, in this significant location and in this auspicious year. It hopes that Walking Together on the Way: Learning to be Church – Local, Regional, Universal will also be known as “The Erfurt Document”. The published text is expected to be available in 2018.